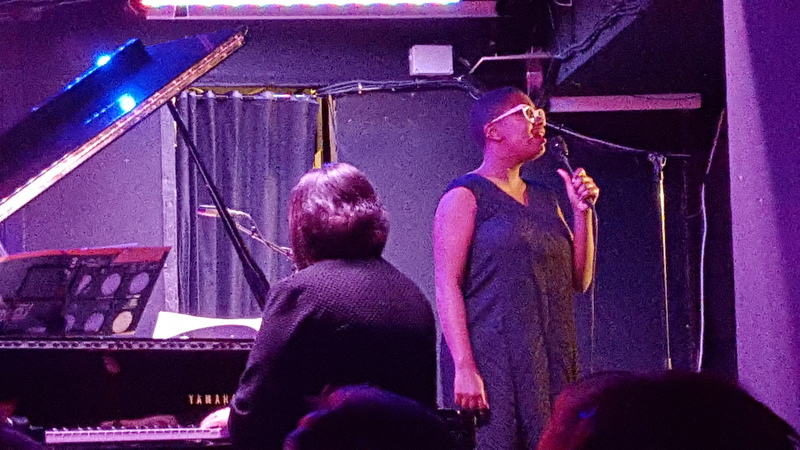 Monday, March 14 – Cecile McLorin Salvant is performing for two sold out nights at the newly refurbished Clamores Club – we were late in getting there and therefore had seats on the side of the stage instead of in front of … but you close your eyes and listen in most cases anyway …. 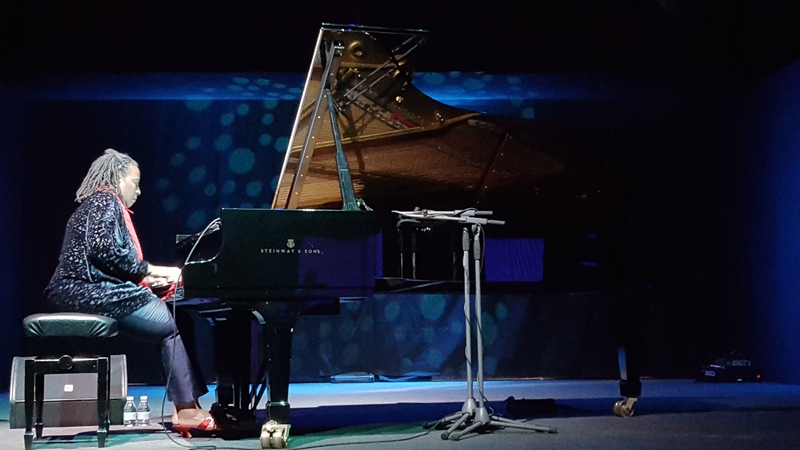 Cecile did a lot of the repertoire from her 2015 album For One To Love, plus a few jazz standards thrown in – she is an incredible singer, with an astonishing technique and amazing control. Her band, Renee Rosnes on piano, Rodney Whittaker on bass and Lewis Nash on drums, was perfect for her – especially Rosnes did some fantastic Soli taking the music to a higher level. McLorin Salvant seemed for me to be better in the standards, more relaxed than in her own songs, which are not on the same level as the standards are. At times I thought that her technique got in the way of expressing deeper feelings, but maybe that was just the room and seeing her from the side … a huge talent in more traditional jazz singing. One to watch out for. 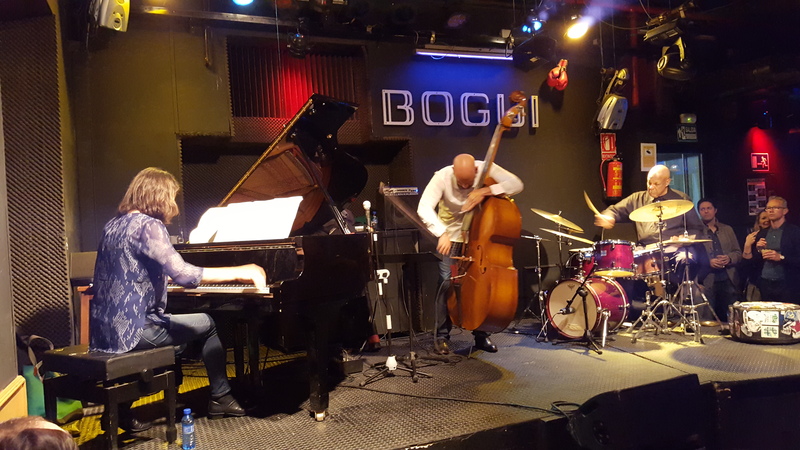 Thursday, March 17 – I hadn’t see Geri Allen for some time and then I heard that she would play in Madrid and of course I had to see and hear her – and it was everything one could expect from a piano solo concert – sheer beauty in expression, melodic improvisations and adventurous excursions into the inner most places of a song … Detroit, Allen’s hometown, stood in the center of the concert and she was performing songs from composers somehow connected to the city (a bit of Motown thrown in of course) – from Alice Coltrane to Michael Jackson and Stevie Wonder, Marcus Belgrave, Monk others – a true trip through the city and its music. The repertoire can be heard on her critically acclaimed 2013 Motema album Grand River Crossing – recommended. 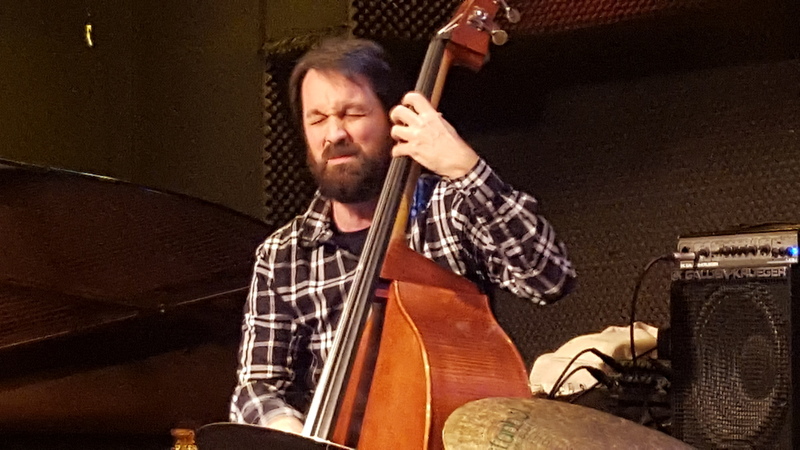 Saturday, March 19 – back to Bogui for a concert of the Eric Revis Trio featuring Kris Davis on piano and John Betsch on drums. Revis, whom I have seen many times with the Branford Marsalis Quartet, takes a slightly freer approach to his music with this trio and explores the essence of the compositions, moving from a beautiful melody to a free improvisation only to go back to the beauty of the song – as if to say: there is more to life than beauty and we need to explore it, as it will lead us back to beauty, but with a different understanding of it. Revis is a great bass player and he showed that not only in his Soli, but as well in the collective trio improvisations and Kris performed with such sensibility and understanding of the music, that all her playing seems to make perfect sense. John Betsch, a historic figure in his own right, played at times with such minimalist use of his drums, but still driving the music forward – he made every hit count …. Outstanding music by a tight-knitted trio. The perfect ending of a great jazz week, which allowed me to listen to three of the most amazing (female) pianists around today and showed again how many ways there are to make great improvised music. Welcome friends .. to the show that never ends …. If I remember right, this was the announcement that opened the ELP show I saw in Vienna on May 17th, 1974 and the concert of Keith Emerson, Greg Lake and Carl Palmer was one to remember for a long time. And it was of course the title of a live triple album from the same year. 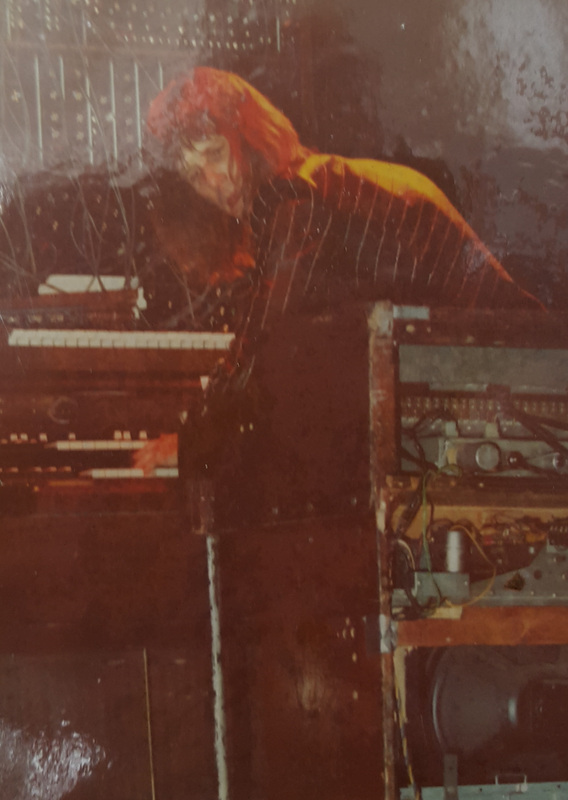 I had followed Keith Emerson since his days with The Nice, whose album Five Bridges (1970) was the first LP I ever bought and ELP were one of my all-time favourite bands with their eclectic fusion of rock and classical music. Now the show unfortunately did end with the passing of Keith Emerson, whose musical inventiveness and powerful compositions and arrangements of classical pieces will not be forgotten. Neither his great showmanship, with his organ set on fire and treated with knifes, jump upon but always creating amazing and captivating music. Rest In Peace! Nana Vasconcelos was probably one of the most amazing percussionists working in improvised music – his own recordings or his contributions to the music of Pat Metheny, Don Cherry, Egberto Gismonti and many others are proof of that – but for me his biggest contribution to jazz and world music came with the group CODONA, featuring Don Cherry and Collin Walcott beside him. They recorded 3 albums for ECM in the years 1979 to 1983 and all three are little masterpieces, with Codona 2 still my favourite. I was lucky to see them perform at the Saalfelden Jazz Festival in Austria in 1981 and it is one of these unforgettable musical moments – magical in many ways, touching my innermost feelings and letting me enjoy music on a different individual level – spiritual and emotional. The death of Collin Walcott in a car crash in Germany in 1984 set an abrupt end to this group, but the recordings are still beauty in sound. Rest in Peace, Nana Vasconcelos.